On a whim, we stop briefly at a temple that overlooks the Mun River a few kilometres upstream from its confluence with the Mekong. The local village folks are working on preparing the temple for a major festival of some kind. The villagers are delighted that 3 foreigners in a black limo have shown up at their temple...they regard it as some sort of positive sign, and want us to eat with them, and come back in a couple of days to be Guests Of Honour at their rituals. The large, Seated Buddha icon has clearly been freshly coated in gold. 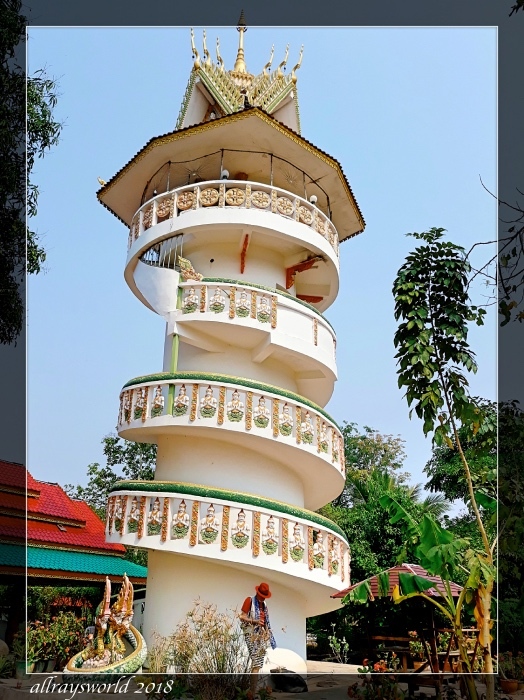 There is a new, and unique, pagoda with a spiral staircase running clockwise from bottom to top...it is not quite completed but will be finished by the time of the festival. 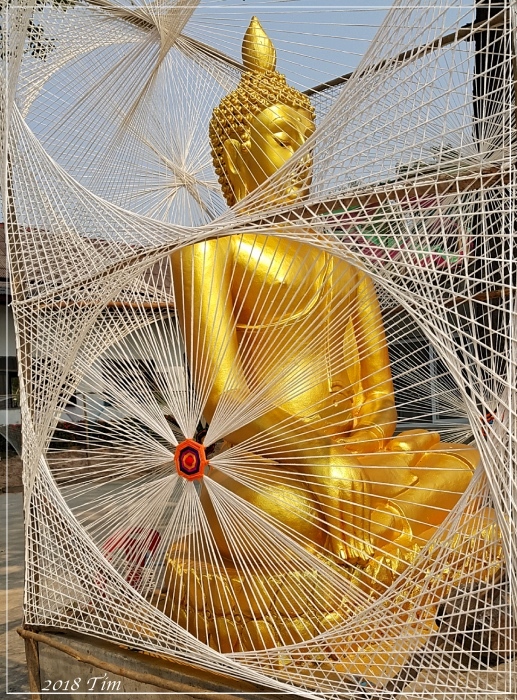 Tim makes an excellent image of a small [about 2.5metres] Seated Buddha icon encased in very neat string-work. String plays an important role in Buddhist rituals...it ties stuff together...at least once each year our entire Village gets a string around its perimeter. Ray: As soon as we got out of the car I went for the pagoda, Larry...I have not seen one quite like it at any other temple. I had to step over makeshift ladders, painting tools, etc, as I climbed the steps. Wonderful documentation.... I love the photo of the string... What a ritual! Ray: I estimate that most of the village was working on decorations at the temple, Elizabeth...clearly a big and important event for them. There was a lot of string work about the place, but this was my favourite bit. All fascinating stuff, Ray, lots of photo app's. Ray: I am liking this region, Frank...fabulously friendly people, and foreign tourists are almost non-existent. Tomorrow I show a bit more from this temple. Ce bouddha est immense. J'aime beaucoup la pagode. Ray: Tous les bâtiments du temple étaient en cours de rénovation pour un festival, et ils avaient tous l'air attirants, Martine. Let us sincerely hope the cohesiveness of this fascinating land is not at risk from digital technology in the form of the internet. The notion of three Westerners arriving in Shangri La in a black limo and being treated like good-luck gods is like something out of a novel..
Ray: Usually some of the Monks are very well informed on what is happening in the rest of the World, Chris...they have a role in ensuring stability in their community. Things like this make me realise what an alien culture the East is to the west Ray. Ray: As Chris said, yesterday, it is like finding yourself in another Universe, Chad. Ray: J'ai aimé ce temple, et j'ai été particulièrement impressionné par l'accueil chaleureux de tous les villageois lorsque nous, étrangers, avons bousillé leur journée bien remplie, Claudine. Ray: Yes...we all learned to do that "art" with nails and string when we were about 5 years old, Alan. At this temple they have continued to practice it. We did not, of course, accept the contention that we were in any way special...we are just curious old blokes who were traveling around in Tim's black limo. That is some very fine work you came across there Ray, you seem to have made a lot of friends on your trip. Ray: More on this tomorrow, Brian. Imaging being asked to be guests of honour! Perhaps someday you'll be King of Siam. Ray: It was an interesting community, Mary. Ray: I liked this place a lot, Peter. More on it tomorrow. I am fascinated by the role of cotton string in Buddhist rituals. the scale of the seated Buddha is impressive, Ray. and a very nice angle on the top shot.